This storytime is designed for children, ages 3- 6 years old, with exceptionalities who have trouble sitting through a traditional storytime. 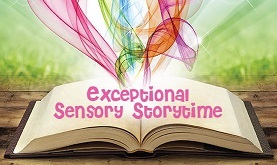 Each storytime, led by a Special Education teacher, is structured with interactive stories, songs, gross motor development, and time for exploring sensory items. Children must be accompanied by a parent or caregiver.